First issue of this web edition start with number 1-2/2008. In his article entitled “Can a state holding company be efficient? If governed by the logic of profit, there will be dividends!”, Mr Borislav Škegro illustrates his standpoint with the example of the forestry and wood processing industry business (relationship). According to him, the wood processing industry records outstanding results in the production, export and employment, but cannot satisfy the demand because it is faced with the limiting factor of the lack of raw wood material (there is not enough wood, says he). He thinks this is absurd, because “there is a surplus of wood in the forests today – up to one third of the total mass of oak, for example.” The wood processing industry would pay for these excess quantities in cash, it would employ new labour force, it would export, earn and pay increased taxes, but “it just does not work – nobody wants dividends”, says he. Evidently, a message for the new minister is to “for a start, add the additional 200 million kuna of dividends to the budget income”; by doing so, there will be “wood in excess, and dividends and taxes in abundance”. When he expostulates on the manner of how a holding company conducts business, he says that only income from the invested capital is measured and that there are no second or third “socially sensitive, generally developmental social criteria ... a dividend becomes an important part of the tax-exempt income of the government budget ... there is no justification for preserving working places and for the social, local and political criteria”. There are also opinions of some wood processing companies which require a ban on the export of logs. They point out that we spend 200 million dollars on the import of furniture made of Croatian logs that were exported cheaply – which is a way of squandering our national wealth. 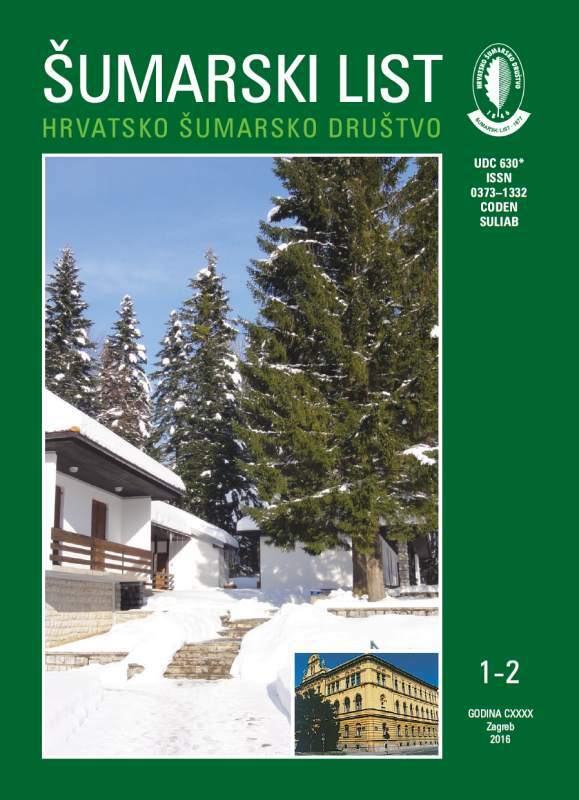 With regard to forestry, the uninformed musings of Mr Škegro, according to which one can fell as much timber as he or she needs, and not according to management plans, are complemented by similar thoughts of the president of the Employers’ Association, which concern primarily the price of raw wood: if it were lower (although currently it is the lowest in Europe), then the Croatian wood processing industry would be more competitive. The first gentleman should be informed that the capacities of the annual cut are limited and that in the spirit of the principle of sustainable management, forestry follows the principle of cutting slightly below the annual wood mass increment and not according to the demands of the over-capacitated sawmill processing. Therefore, it is out of the question that there will be wood in excess and dividends in abundance. There can be dividends only if the Croatian wood processing industry applies itself to cutting down on the 80% of production costs, rather than constantly lamenting on the excessively high price of raw wood material, which accounts for a maximum of 16–20% in the cost structure. In addition, it should do its utmost to use the best quality raw material in the final product with the highest added value. We are sure that the wood processing industry can be forced to do the aforesaid only by market prices of wood assortments. Another step to take is to turn to cutting edge technologies and investment into knowledge on all levels. We agree that log export should be banned, because we have already pointed out in previous texts that 8 m3 of exported logs equals one exported work place. However, as far as we know, apart from some soft broadleaves and products which the Croatian wood processors are not interested in, the company Hrvatske Šume Ltd does not export logs, unlike some wood processors. This means that for the sake of export, they “camouflage” a part of the quantities contracted at a non-market price into different forms of minimal sawmill products (Count, Flitch, Square and similar). As for imported furniture, we are confident that people would rather buy a home-made piece of furniture on condition that it is cheaper but of equal quality as the imported one. Why it is not cheaper and of good quality rests on our wood processors, who have home raw material available at non-market prices and at almost no transport costs. Our articles have repeatedly pointed at squandering the national wealth when writing about forestry as a specific economic branch, but not as an economic branch viewed by Mr Škegro and some private wood processors. Obviously, in vain have we tried to explain that apart from its raw material role, the forest also has other roles, such as the ecological, social and eco-physiological roles, which are several times more valuable than the raw material role. Consequently, managing a forest is in stark contrast with the proclaimed “holding approach”. It is high time we finally formulated a consistent forestry policy (we wrote about this in Forestry Journal 11-12/2014), adding to this the wood processing industry, which should implement the newly-formulated strategies. By doing so we will put a stop to absurd irrational contemplations on forests, do away with non-market relationships between forestry and wood processing industry, and define an adequate status of forestry within Croatian economy. CAN WE PREDICT SPHAEROPSIS SAPINEA OUTBREAK BY MONITORING FUNGAL DIVERSITY IN AUSTRIAN PINE PLANTATIONS? Fungal diversity plays an important role in forest ecosystems stability as well in the health status of mycorrhizal forest trees. At research area in Istria, Croatia, pathogenic fungus Sphaeropsis tip blight (Sphaeropsis sapinea (Fr.) Dyko et Sutton) caused substantial damage in Austrian pine (Pinus nigra J. F. Arnold) plantations during the last decades. This research continues on previous done in Austrian pine plantations on predisposition to S. sapinea infections, where site and stress conditions were determined as key factors, but also, the ectomycorrhizal (ECM) fungi were confirmed as biological indicators of the health status in selected plantations. We analyzed fungal diversity of Austrian pine plantations to determine the dependence of species richness and its diversity index, both for total and ECM species only, in relation to S. sapinea infection rate and crown transparency of selected trees. Fungal samples were collected during 2013 at nine permanent research plots in autumn season. Their total and ECM species richness and diversity index were correlated to Sphaeropsis tip blight infection level and crown transparency. Our results did not confirm the hypothesis that Austrian pine plantations with higher total species richness and its diversity index are more resistant to S. sapinea infection nor to crown transparency. Oppositely, ectomycorrhizal species richness and its diversity index might be used as good biological indicators of S. sapinea presence and crown transparency of studied plantations. Vegetative production techniques, of which cutting method widely used in propagation of ornamental plants, have a crucial role for conserving the plant genetic sources. On rooting development of stem cuttings, cutting position, rooting medium and rooting hormone are some of the critical factors that affect the success. The primary objective of this study is to determine the best hormone doses and ideal rooting medium on Ficus benjamina L. stem cuttings. Conventionally, the most frequently vegetative propagation method is the rooting of the stem cuttings in various media such as, pearlite, peat, sand, through exposure to high-concentration rooting hormones (IBA, IAA, NAA, etc.). But, this conventional technique requires wide areas in the rooting stage of mass production, prevents monitoring the course of rooting, and necessitates large amount of materials used as hormones and rooting media. In this study, a new method that may be preferable in mass production of plants was tested. 39 different treatments were carried out, and their results were evaluated. Sand, and perlite were used as solid rooting media. Stem cuttings were kept in low-concentration hormones permanently after cutting (liquid medium). In this way, their rooting capability were examined. Rooting trials were conducted before stem cuttings were taken to solid rooting media. As conclusions, the highest rooting ratio were obtained for 10 ppm of NAA (94.43%) and 100 ppm of IBA (93.9%) in liquid media. Moreover, the highest root length and the average root length were quite low in liquid media. This paper presents an invasive plant species that occur in the forests of Kalnik. It also presents the state of the distribution and their impact on forests of Kalnik. A total of 14 invasive species in the forests of Kalnik and these are – Acer negundo L., Ailanthus altissima (Mill.) Swingle, Ambrosia artemisiifolia L., Amorpha fruticosa L., Asclepias syriaca L., Conyza canadensis (L.) Cronquist, Echinocystis lobata (Michx.) Torr. et Gray, Erigeron annuus (L.) Pers., Impatiens glandulifera Royle, Juncus tenuis Willd. ), Phytolacca americana L., Reynoutria japonica Houtt., Robinia pseudoacacia L., Solidago gigantea Aiton. Alochtonous vegetation is not only inevitable, but it also appears to be a constant future challenge in the globalizing world which communicates on all levels with every means possible. Its influence should not by any means be marginalized. Its importance and influence is not completely negative and there are possible benefits and dangers which should be controlled by the preventive measures and physical regulation. The most important species in Kalnik forest vegetation is definitely acacia. It is especially important for private forest lands where acacia tree has become very popular because of its characteristics as a fast growing tree species without any special requirements with relation to growth and it gives fast results concerning timber and firewood. Private lots are usually very small and fragmented. There is a growing need for timber, therefore the trees are grown extensively, from stumps and roots. Other woody species still do not pose a serious threat in economical or biological sense. The impact of herbaceous plants differs in various areas. The most problematic issues for the forestersare thick layers of unwanted specieswhich grow in young forest stands or in forests in the phase of restorationwhere these unwanted speciesinvasively compete with autochthonous species. In biological sense, invasive species pose a constant threat not only to domestic vegetation and biodiversity, but also to human health. We should also mention apiculture, a very important and well developed activity on Kalnik. Above mentioned species are very important and interesting for apiculture as a type of rich bee pasturage. Apiculture in this area depends on acacia pasturage and it is one of very important reasons for growing acacia tree. Other tree species are also valuable for bee pasturage, especially late in autumn when there is no other bee pasturage available and they are mostly species which blossom in autumn and represent a valuable source of pollen (Japanese Knotweed, Prickly cucumber and European goldenrod). Generally speaking, the biggest responsibility for possible consequences of invasive plant species to the vegetation of Kalnik lies on foresters who have to recognize and monitor the appearance of invasive species, especially in state forest lands where they grow and directly influence their composition and state.